The Dell XPS 13 is back for the new year, and it’s a true return to form. The 2019 Dell XPS 13 finally fixes the biggest bugbear: the awkward camera placement, and also extends battery life. Is Dell making a laptop with two detachable displays? However, beyond these improvements, the Dell XPS 13 isn’t much different than its predecessors, continuing the lineage of one of the best laptops ever made. This time around, though, the high-end Ultrabook scene has drastically changed. So, the Dell XPS 13’s place at the podium has shifted ever so slightly, thanks to tough competition from the likes of Asus and Huawei. So, the Dell XPS 13 2019 isn’t the best laptop in the world anymore, but it’s still one of the top laptops to beat right now. There are three more models on offer, topping out with an 8th-generation quad-core Intel Core i7 CPU, 16GB of RAM and a 2TB PCIe SSD – all behind a beautiful 4K (3,840 x 2,160) touch display. But, you’ll be paying a whopping $2,609 for this model. UK buyers will find the Dell XPS 13 starting at £1,379, with an Intel Core i5 CPU, 8GB of RAM and a 256GB SSD behind a 4K touch display. Australian readers will find the Dell XPS 13 starting at AU$2,299 with the same internals and a Full HD display. There are plenty of different configuration options for the XPS 13, but there are more for US customers than those in the UK and Australia. But, higher storage options are locked behind some high price hikes. 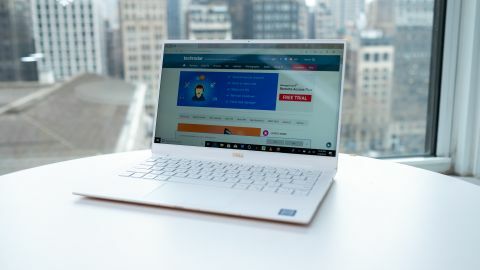 But, that doesn’t change the fact that the Dell XPS 13 is still competitive with similarly priced rivals – save for the mind-blowing value of the flagship Huawei MateBook X Pro, especially at the high end. At first glance, the Dell XPS 13 looks identical to last year’s model, and that’s largely the case here. However, Dell didn’t simply take an 'if it ain’t broke' approach this year, but finally solved the laptop’s most glaring design flaw: the webcam is finally above the display. The webcam probably won’t blow your mind, but we appreciate the wider frame for capturing co-workers or friends beside us more easily. Taking 0.9 megapixel stills and 720p video, you’ll look find in meetings, just don’t expect Twitch broadcaster quality here. Elsewhere, the build quality and design language are the same as before. The laptop is just as thin and light as last year at 0.46 inches (11.6mm) and 2.7 pounds (1.23kg), respectively. The Dell XPS 13 also sticks to the same anodized aluminum screen lid and base, coupled with a woven carbon fiber (or glass fiber on light colored models) keyboard deck. As for the keyboard itself, it’s just as punchy and responsive as ever, and the glass-coated touchpad is still a pleasure to use. This is one of those areas where the Dell XPS 13 truly wasn’t broken and didn’t need fixing.